A blog about cooking and taking pictures. 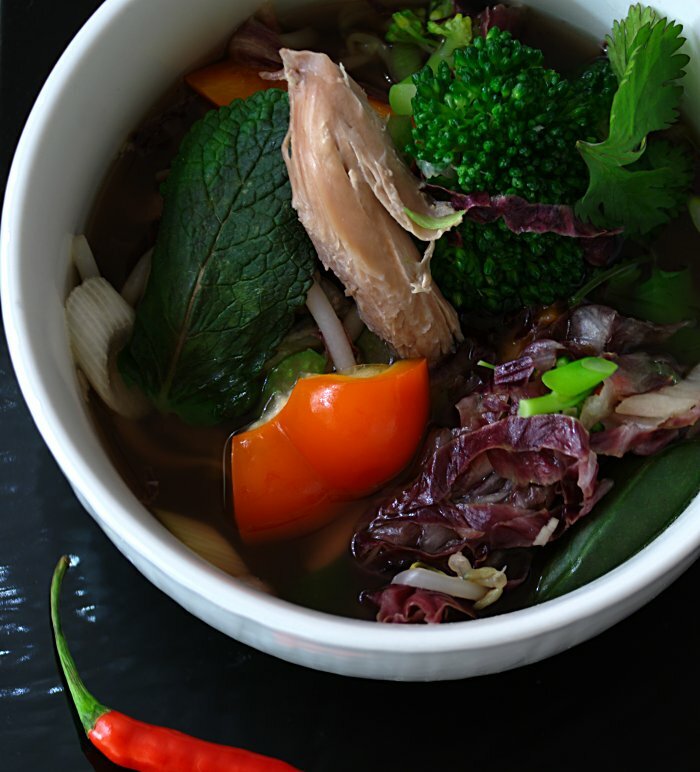 With the stock we made yesterday with the duck carcass, we made Vietnamese soup tonight. We added fish sauce, ginger, lemongrass, red cabbage, red peppers, broccoli, bean sprouts, one small minced chili pepper and some of the leftover duck meat. We garnished it with fresh mint, basil and coriander. These soups usually have vermicelli but we avoid eating rice, pasta, bread or potatoes (except for sweet potatoes) for dinner. There was still stock left so we froze it in an ice cube tray. This way we will be able to take a few cubes when we want to make individual soups for our weekday lunches. All we will need to do is add vegetables. We will also make Vietnamese spring rolls with the leftover duck. There are so many things you can make with just 1 duck or chicken. Starting this blog has really made us pay attention to what we eat. 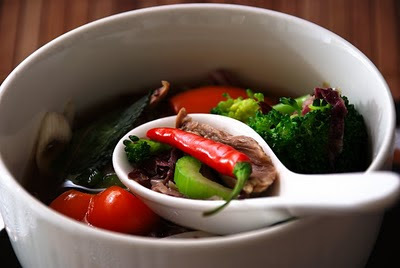 Our goal is to make the healthiest meals possible but also make them visually appealing. It may seem like a lot of work to cook all these meals but in reality, it usually takes less than 30 minutes to make most of our dinners. So far I have used only available light for the pictures. I seems to give the most natural feeling. The meals are set on the kitchen table and I prefer using only the kitchen counter lights for lighting. I do not use the overhead lamp that is placed directly over the kitchen table. This light is too direct and everything looks nicer with a soft light coming from an angle. With the kitchen table light turned off, the scene is pretty dark. Since I am taking a picture of a fixed object, I use a tripod and long exposure. For the plate shots, I use the aperture setting and usually boost the level (+-) to make it look brighter. Copyright, Simon and Sophie. Simple theme. Powered by Blogger.